Thomas Dewing was born in Newton Lower Falls, Massachusetts. As a young man, he studied at the Boston Museum School. He also worked briefly as a lithographer and as a chalk portraitist in Albany, New York. In 1876, the artist journeyed to Paris, studying at the Académie Julian with Jules Lefébvre and Gustave Boulanger and training in the ‘academic’ manner of painting. Upon his return from Europe, Dewing established his studio in New York City, where he became a familiar in the social circle which formed around Richard Watson Gilder. It was here that he met his future wife, artist Maria Oakey. Beginning in the last decade of the nineteenth century, Dewing’s style became increasingly soft edged, showing the strong influence of James McNeill Whistler and George Inness. Yet Dewing never altogether abandoned his academic training. His unique position in the ranks of American Tonalist artists lay precisely in his marrying the academic manner with the Tonalist aesthetic. Dewing’s paintings characteristically depict elegant women in classical dress cavorting in a lush landscape or lounging, sometimes with musical instruments, in a richly appointed interior. The figures are not depicted as real women, however, but assume at times a frieze-like quality. They are abstracted by the haze or film, perhaps of memory, through which we see them, and the compositions have an overall dream-like quality. Dewing was a member of the National Academy of Design and the Society of American Artists. He left the latter organization in 1897, however, to join John Twachtman, Julian Alden Weir, and others in forming the group known as the Ten American Artists. Dewing spent his summers from 1895 to 1902 at the Cornish Art Colony in New Hampshire, and he became a close friend of Tonalist artist Dwight Tryon. His success was assured by wealthy businessmen John Gellatly and Charles Lang Freer, who each acquired significant collections of his work. 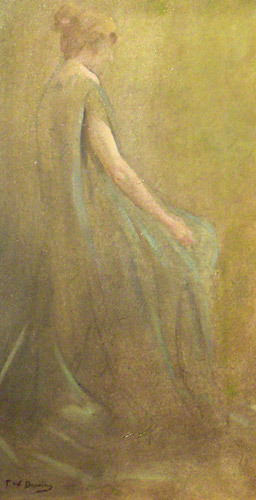 Dewing has been the subject of numerous art historical studies in recent decades, and his work can be seen in many major museums, including the Metropolitan Museum of Art, the Museum of Fine Arts, Boston, the Freer Gallery of Art, the Isabella Stewart Gardner Museum, the National Gallery of Art, the Smithsonian American Art Museum, the Brooklyn Museum of Art, the Whitney Museum of American Art, the Wadsworth Atheneum, and the Memorial Art Gallery (Rochester).